5: What’s keeping homeownership costs higher in Illinois? Illinois’ people problem is clear. The state is consistently in the red when it comes to domestic migration, which has led to population decline for four consecutive years. Clearly, Illinois has had a long struggle with attracting new residents and getting them to stay. One reason for this: Poor public policy has made buying a home, planting roots and raising a family in Illinois less attractive than other states. By adding costs that are not out of pocket and adjusting for tax offsets, the user cost concept provides a good estimate of the real cost of owning a home and emphasizes the investment dimension of homeownership. Nationwide, the user cost of homeownership has declined by 19 percent relative to the pre-housing bubble period (2002-2004). This is good news for homeowners. But what about in Illinois? Unfortunately, the user cost of homeownership in Illinois hasn’t declined at all. 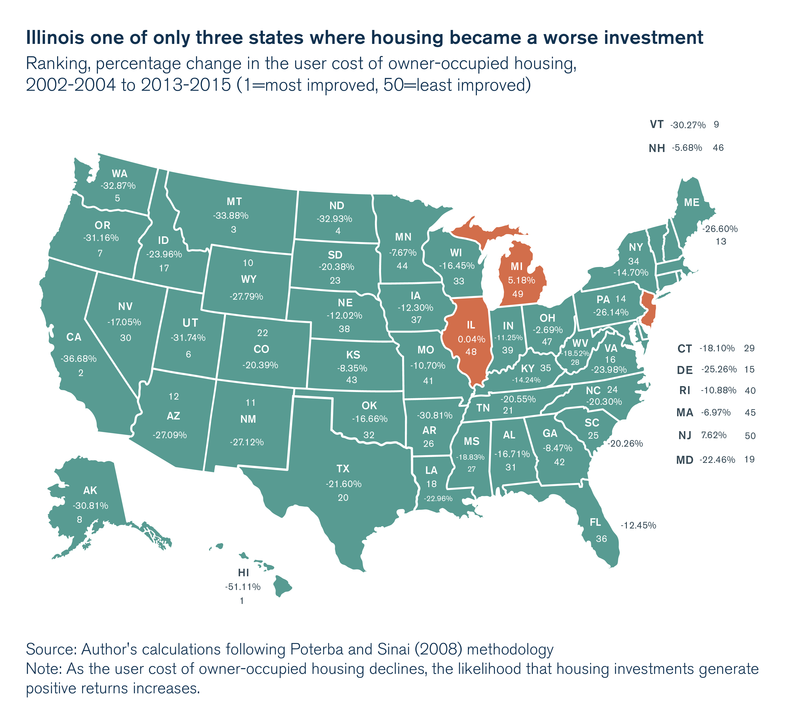 Due primarily to some of the nation’s most severe increases in income and property taxes, Illinois is one of only three states where housing has become a worse investment. Illinois ranked 48 out of all 50 states in terms of improvements in the user cost of homeownership, and now has the eighth-highest cost of homeownership in the nation, up from 25th-highest in the pre-housing bubble period. For every $100 in home value in Illinois, homeowners are now paying $10.15 in annual costs associated with owning their home – more than in 42 other states. Measuring these homeownership costs points to one simple fact: Housing in Illinois has become a worse investment relative to housing in other U.S. states. This has been driven largely by increases in income taxes and property taxes. These findings are of particular importance for low-income families in Illinois, since higher costs associated with homeownership have a disproportionate negative effect on low-income households. Only Michigan and New Jersey performed worse than Illinois in terms of improvements in homeowners’ costs as a share of home value. While Michigan’s place in the ranking is predominantly due to both a drop in home values and an increase in effective property tax rates post-recession, New Jersey’s and Illinois’ changes in the rankings were primarily the result of higher taxes. At the other end of the spectrum are the top three states of Hawaii, California and Montana. Hawaii’s home- owners benefited from a 40 percent cut in effective income tax rates and a 60 percent increase in property values when compared with the 2002-2004 period. California benefited from high housing price appreciation, and Montana benefited from both a large decrease in property taxes and rapid housing price appreciation. Interest rates, which are at near-historic lows, were the primary driver of a reduction in the user cost of owner occupied housing nationwide. Unfortunately for Illinoisans, rising income and property taxes have offset any benefit from lower borrowing costs. Compared to the 2002-2004 period, income taxes rose 19 percent in Illinois, while they fell 4 percent throughout the rest of the nation. An increase in income taxes constrains households and potential home- buyers, discouraging investment in housing and other capital. Illinois is one of the three states with the largest increases in income taxes paid as a share of income when comparing the 2002-2004 period with the post-recession period. But Illinoisans didn’t just see an uncommonly high leap in their income taxes over that time period. Property tax rates were up 38 percent for the median Illinois household, while the rest of the U.S. experienced an increase of only 8 percent. Especially concerning is the fact that property taxes increased faster in Illinois even though home values lagged the rest of the country. Illinois ranked 47th in terms of improving its property tax burden, just behind Louisiana, Massachusetts and New Jersey. Unfortunately, all Illinoisans, not just homeowners, have been affected by the state’s poor public policy decisions. Even renters have experienced drastic negative effects. In the post-recession period, the median rent has increased 24 percent in Illinois. It is noteworthy that the median rent increased by 24 percent while the user cost of homeownership remained virtually unchanged, and home values decreased by 0.5 percent over the same time period. One explanation could be that potential homeowners – discouraged by high property taxes and low home price appreciation – are instead choosing to rent, thus contributing to the increase in rental prices. While homeownership rates peaked in 2004 and declined through 2016 in both Illinois and the rest of the country, homeownership rates fell more sharply in Illinois than the rest of the nation. With higher housing costs, primarily in the form of hiked income and property taxes to pay for government worker pensions, there is no reprieve to be found for Illinoisans looking to plant roots – homeowners or renters. Given the 24 percent increase in rents despite stagnant property values, renters in Illinois pay more rent as a proportion of home value when compared with the rest of the U.S. Illinois had the third-largest increase in rent as a percentage of home value (ranked 48th) when compared with the rest of the country. What this means is that renters in Illinois now pay higher rents for less housing compared with renters in other parts of the nation. As more tax collections are diverted to pensions instead of delivering services that create value for Illinoisans and make Illinoisans more productive, it is not surprising that growth in home values has been suppressed in Illinois relative to rest of the U.S.
Reducing the cost of homeownership in Illinois means bringing down the cost of pensions. Without a reduction in Illinois’ pension liability, housing investment throughout the rest of the nation will continue to be a relatively more attractive proposition. Illinois’ “recovery” from the Great Recession has been accompanied by four consecutive years of population decline, driven primarily by young families fleeing the state. These families, looking for a place to plant roots, have found that investing in a house in Illinois has become too costly relative to life in other states. The Great Recession was particularly bad for Illinois homeowners. Not only did home values decline more in Illinois than the U.S. average, but the Illinois housing market has also been recovering at a much slower pace. While the rest of the nation has recovered from the housing crisis, house values in Illinois are still below their pre-recession levels, and housing price appreciation continues to lag the rest of the nation. Prior to the recession, Illinois’ housing appreciation tracked the U.S. average quite well. Since then, there has been a divergence in housing appreciation between Illinois and the rest of the country. Wasteful spending that led to increases in Illinois’ income and property taxes are largely to blame. Demand in the housing market depends on the user cost of owner-occupied housing.1 When the user cost of owner-occupied housing increases, demand for housing decreases. This is because a higher user cost of owner-occupied housing reduces the benefits of owning a house. Illinois’ poor growth in house prices implies the growth in the demand for housing units lags supply, compared with the rest of the country. This is consistent with higher time on the market, or TOM, for sellers in Illinois relative to the national average. This longer TOM coupled with declining sales is an indication that in Illinois, families find purchasing a home less attractive than in other states. While some experts remain optimistic,2 uncertainty over the state’s economic outlook coupled with Illinois’ rising tax burdens dampens price growth. The cost of homeownership is an important part of the decision to enter the housing market. This report compares the change in the user cost of owner-occupied housing in Illinois and the rest of the U.S. before and after the housing crisis. The model is based on the existing expert literature on the topic, notably Poterba and Sinai (2008).5 The cost of homeownership is the sum of the opportunity cost of investing in housing, the cost of maintaining a home and the property tax bill net expected home value appreciation, among other factors (see Appendix I). The data come from Freddie Mac for loan-to-value ratios, the U.S. Census Bureau, and the St. Louis Federal Reserve Bank data for interest rates (see Appendix II). The findings suggest that while the user cost of owner-occupied housing has decreased across the country after the recession, predominantly due to lower interest rates, it has remained virtually unchanged in Illinois because of higher income taxes and property taxes. This means that homeownership in Illinois has become less attractive relative to the rest of the country. For every $100 in home value in Illinois, homeowners are now paying $10.15 in annual costs associated with homeownership – more than in 42 other states. These findings are of particular importance for low-income families since higher costs associated with homeownership have a disproportionate negative effect on low-income households.6 This is because lower-income households are more likely to: 1) own older homes, which means they face higher maintenance costs; 2) have a mortgage; and 3) take on more debt to finance a home purchase. Additionally, these higher costs reduce the returns to their investments in housing. Low-income households have more of their wealth invested into their homes than other income groups, meaning they are most negatively affected by lower housing returns. Moreover, the user cost of homeownership affects housing demand and home prices. Studies have linked the increase in homeownership rates in the 1960s and 1970s to a decline in the cost of homeownership, largely due to low mortgage rates.7 The subsequent rise in mortgage rates in 1979 and 1980 contributed to the house price slump during that period. Since mortgage rates (and interest rates) do not vary much across U.S. states, only state-specific factors can explain differences across states in the user cost of owner-occupied housing. For Illinois, higher costs relative to other states imply slower growth in the demand for housing, resulting in lower housing price appreciation. Homeownership is a commitment to personal financial security. Through homeownership a family acquires a place to live and raise children and invests in an asset that can grow in value and provide the capital needed to start a small business, finance college tuition, and generate financial security for retirement. Homeownership is a commitment to strengthening families and good citizenship. Homeownership enables people to have greater control and exercise more responsibility over their living environment. Homeownership is a commitment to community. Homeownership helps stabilize neighborhoods and strengthen communities. It creates important local and individual incentives for maintaining and improving private property and public spaces. Homeownership is a commitment to economic growth. Homeownership helps generate jobs and stimulate economic growth. The design, construction, and rehabilitation of homes employs local labor and uses a vast array of American-made products and services. Homebuilding has often led the economic recovery from national recessions due to its strong job multiplier effect and because increased housing starts and home sales represent renewed economic confidence. Employment growth and housing price growth are strongly correlated. Recent economic research highlights links between regional labor and housing markets. In their article “The Recent Evolution of Local U.S. Labor Markets,” authors Maximiliano Dvorkin and Hannah Shell examined the recession and recovery by reviewing the correlation between county-level unemployment rates and changes in housing prices.9 U.S. counties with larger decreases in housing prices experienced larger increases in the unemployment rate. This means declining home price appreciation could have negative spillover effects on the rest of Illinois’ economy. Illinois’ weaker housing market recovery is consistent with the state’s much weaker employment growth and weaker economic growth when compared with the rest of the country. This report adopts methodology from the existing expert literature on the topic, notably Poterba and Sinai (2008),10 to compare the user cost of owner-occupied housing for all 50 states before (2002-2004) and after (2013-2015) the housing crisis and the Great Recession. In order to invest in housing capital, individuals must give up on other types of capital investments. The user cost of owner-occupied housing is not only a homeowner’s cost of owning and maintaining the property, but also a function of the general economic conditions in a region and the returns on other types of investments. How did the user cost of owner-occupied housing in Illinois change over time? Computing the user cost of owner-occupied housing during the observed time periods reveals that the cost decreased in the rest of the United States by 19 percent, predominantly due to lower interest rates. However, the cost remained virtually unchanged in Illinois (an increase of 0.04 percent). While housing costs have fallen primarily due to low interest rates, poor public policy decisions have completely offset any benefit from low interest rates in Illinois. This means that owning a home in Illinois has become less attractive than in most U.S. states. This finding is consistent with lower home price appreciation in Illinois relative to the rest of the nation. Since the end of the recession, Illinois is one of only three states to see an increase in the user cost of homeownership. What’s keeping homeownership costs higher in Illinois? The following map ranks states by the improvements in the user cost of homeownership. Despite not having a progressive income tax, Illinois’ flat income tax rate increased while incomes stagnated. Illinois went from 27th place of 50 states in 2002 to fifth place in 2015 in terms of states with the highest income taxes paid as a share of income. 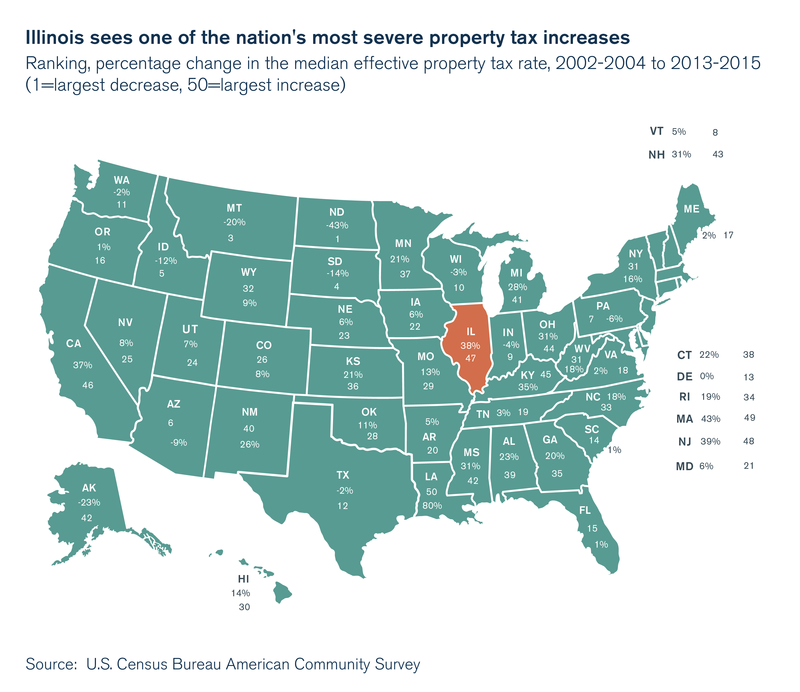 Due to recent income tax hikes, Illinoisans have shouldered a greater increase in their income tax burden than all other U.S. taxpayers in the post-recession period, except for those in North Dakota and Connecticut. This means Illinois is ranked 48th in terms of most improved income tax climate when comparing the pre-housing bubble and the post-recession periods. Traditionally, residents expect property taxes to fund services that improve neighborhoods and raise home values. Instead, less than half of every additional dollar levied in property taxes in Illinois since 1996 went to the delivery of services that improve home values.14 The rest of the increase in property taxes went to pension payments for government workers and debt servicing. Oversized pension promises, increasing life expectancy and a decline in investment returns have all contributed to larger pension contributions than taxpayers can afford. The loan-to-value ratio measures the amount borrowed for buying a house as a proportion of home value. It is a measure of affordability. The data reveal that the debt taken on to finance a home before and after the housing collapse remained roughly constant throughout the country. Illinois’ median loan amounted to 78 percent of median home value before the housing bubble, and 79 percent after, while the median loan in the rest of the U.S. was 78 percent of median home value before the recession and 78 percent after. Maintenance costs measure the cost of upkeep and living in the property. It is a sum of annual home-ownership association fees (if any), annual electricity cost, annual home heating fuel cost, annual mortgage payment obligations, annual water costs, annual gas costs and annual property insurance cost. In percentage terms, Illinois’ maintenance costs as a share of home values have increased by 17 percent from the pre-housing bubble period to the post-recession period, while housing maintenance costs as a share of home values in the rest of the country decreased by less than half a percentage point. While maintenance costs increased in absolute levels across the U.S., home values grew at a much faster rate than in Illinois, thereby fully compensating for the growth in maintenance costs. This is not true for Illinois, as home values have failed to keep up with increasing maintenance costs. Unfortunately, it is not just housing costs for homeowners that are higher in Illinois relative to the rest of the country. While home values and the user cost of owner-occupied housing in Illinois remained virtually unchanged when comparing the pre-housing bubble period to the post-recession period, annual rents have grown by 24 percent. Although Illinois’ 24 percent increase in rents was one of the slowest in the nation, growth in Illinois home values lags. This means Illinois’ renters are paying more for less housing when compared with renters in other states. Illinois is one of the worst performing states for the change in rents as a proportion of home value when compared with the rest of the U.S. Measuring homeownership costs points to one simple fact: Housing in Illinois has become less attractive relative to housing in other U.S. states. This has been driven largely by increases in income taxes and property taxes. There is no reprieve to be found for Illinoisans – homeowners or renters. With greater housing costs, it is not surprising that the post-recession growth in home values has been suppressed in Illinois relative to rest of the U.S. This is more painful for homeowners since home appreciation has yet to match the pre-housing bubble period. Higher user costs for homeowners can result in lower demand for housing. Lower demand for housing has a grave impact on Illinois communities as homeowners tend to be more invested in community development than renters. There are several things state and local lawmakers can do to improve Illinois’ housing market and reduce the gap between Illinois homeownership costs and those in the rest of the nation. First, Illinois homeowners need real, sustained property tax relief. Currently, homeowners face the second highest property tax burden in the nation, largely because of an unsustainable public pension system. If Illinois and its local governments were able to reform their unaffordable pension systems, the state could contribute more money toward classroom spending and reduce its overall spending, and localities could provide property tax relief. Second, Illinoisans need a state government that spends within its means and doesn’t seek to raise income taxes as other states are moving in the opposite direction. The Illinois Policy Institute has proposed a path to balancing the budget that requires no tax increases. One key policy solution the Institute offered for fiscal year 2019 is a spending cap, which would limit the growth in government spending to the long-run average growth rate of the state economy. Tying government spending to economic growth protects taxpayers from future tax hikes. Democratic and Republican lawmakers proposed spending cap constitutional amendments in both the Illinois Senate15 and House of Representatives16 this year. James Poterba, David N. Weil, and Robert Shiller, House Price Dynamics: The Role of Tax Policy and Demography, Brookings Papers on Economic Activity 1991, no. 2 (1991): 143-203. doi:10.2307/2534591. Regional Economics Applications Laboratory, Housing Price Forecasts Illinois and Chicago PMSA, March 2018, March 21, 2018. James Poterba and Todd Sinai, Tax Expenditures for Owner-Occupied Housing: Deductions for Property Taxes and Mortgage Interest and the Exclusion of Imputed Rental Income, American Economic Review, 98 (2) (2008): 84-89. George McCarthy, Shannon Van Zandt, and William Rohe, The Economic Benefits and Costs of Homeownership: A Critical Assessment of the Research, (working paper, Center for Urban and Regional Studies, University of North Carolina at Chapel Hill, 2001). Patric H. Hendershott, Real User Costs and the Demand for Single-Family Housing, Brookings Papers on Economic Activity, Economic Studies Program, Brookings Institution, vol. 11(2), (1980): 401-452. U.S. Department of Housing and Urban Development, The National Homeownership Strategy: Partners in the American Dream, Washington, D.C., (1995). Maximiliano Dvorkin and Hannah Shell, The Recent Evolution of U.S. Local Labor Markets, Economic Synopses no. 15 (2016). Orphe Divounguy, Bryce Hill, and Joe Tabor, “Pensions Make Illinois Property Taxes Among Nation’s Most Painful,” Illinois Policy Institute, August 2018. Senate Joint Resolution Constitutional Amendment 0021, 100th General Assembly, 2018. House Joint Resolution Constitutional Amendment 0038, 100th General Assembly, 2018.